KUDUS - For the very time, Appreciation Forum of Kudus Literates and Cultures (Fasbuk) has managed a theater on the stage collaborating with the artists of Kalanari Theater, well known as Kalanari Theatre Movement. 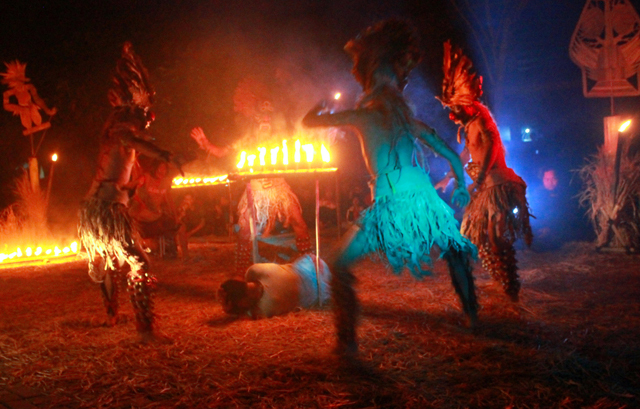 Last Friday night (15/5/2015), the staging took place in the parking lot of Muria Kudus University (UMK), with the play of “Kapai-Kapai” Arifin C. Noer which almost the whole dialog was brought in Javanese. Being crowded by numerous artists and art lovers from the city of Kretek, Yogyakarta and its surroundings, the event was opened by a monologue from Dalang which dazzlingly broke the silence of the night. Some torches were placed around the stage then the play began. There a married couple, Abu and Iyem, who lived in poverty, who were persuaded by the Dalang telling story about a prince and a princess who lived happily using the mirror of deceit. The rumor said that if someone owned the mirror, any wishes would be come true. Then, Abu asked the Dalang where he could buy that mirror. The Dalang answered, it was very far, far away, in the shop of the Prophet Sulaiman as. The answer from the Dalang got Abu more confused. As he wandered for the mirror, he asked everyone he met: the bird, the frog, the weed, the water, the cricket, and all he met. As the result, all his effort to find the mirror, made Abu into a couch potato and it started conflict on his family. His wife, Iyem, was no longer bearing any patience seeing her husband who didn’t want to work. The climax came by the presence of Kelam, the boss of the poor couple shouting with the bell that made Dalang remind Abu and Iyem to find the mirror as soon as possible. Finally, Abu almost got the mirror of deceit. He reached the center of the earth. But, the time he grabbed the mirror, he died all of sudden. The crowd of the artists, the dancers, and the back sound that accompanied Abu’s dead body, marked the ending of the story of “Kapai-kapai” and at last the big applause from the audiences rose. After the theater ended, a discussion session was opened to share the process in the making of “Kapai-kapai”. There, the audiences were allowed to give comment about the play. Ibed Surgana Yuga, the director, told that “Kapai-kapai” was firstly staged in 2013 as on of cultural movement art work contributed by Kalanari Theatre Movement and Sanggar Bangun Budaya. “We performed this play in Indonesia’s Theater Stage 2013, Jogja Theater Fest 2013, Helatheater by the support of Salihara Community on April 2015. Now, supported by Kelola Art Grant, we can put this play on stage in Kudus and, later, in Salatiga,” he claimed. He also added, the play, “Kapai-kapai”, was used as a medium of cultural movement and dialog forum between Kalanari which focuses on modern theater but still welcome to traditional art and Bangun Budaya which concerns on Javanese art but still it is open to renewal contemporary art. “From there, an idea to Javanize the masterpiece of Arifin C. Noer was born,” said the director who was born in Bali, “Since we don’t want to get tied down in the so complex Javanese art, we manage to make this play to a simpler Javanese art,” he continued. Then, he argued, Javanese art extents by a cosmology that we create by compiling some parts from the Javanese sense of Bangun Budaya, and the Kalanari’s artists who come Yogyakarta, Banyuwangi, Tulungagung, Malang, Palembang, Java itself. Vivin L. Prinka, who plays as Iyem, revealed that Javanese is chosen because they deemed that it is a language of honesty. “Javanese is our mother tongue. We grow along with it. If we used Indonesian, it will come manufactured. So unnatural,” conveyed by the students of Theater Department of ISI Yogyakarta.